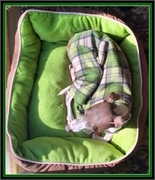 The Italian Greyhound Indoor/Outdoor bodysuit is a medium weight fleece that can be worn inside and out! An excellent choice for dogs inside a cold house, and outside in very chilly weather. A great fall/spring bodysuit for northern states, and all winter bodysuit for regions that are mildly cold. For very cold weather, please use a heavy fleece in walks and extended stays outside. The Indoor/Outdoor bodysuit stretches for easy on/off, resists rain, and is machine washable/dryable. For the best fit, please write your dogs' length, girth, height and weight measurements in the comments section of your order.